My family has adjusted to me having to be gluten free pretty well. Low carb is another story. It’s a good thing I have pretty decent willpower, because I’d have a revolt on my hands if I threw all the breads and sweets out of the house. Ugh, you see my struggle. But at his last checkup, his doctor was concerned about his sugar levels. So guess who else is low carbing it in the house? If low carb at my house was gonna fly, I had to come up with some impressive desserts to keep my DH’s hands off of the Little Debbies. And that’s how my low carb flourless brownies were born. 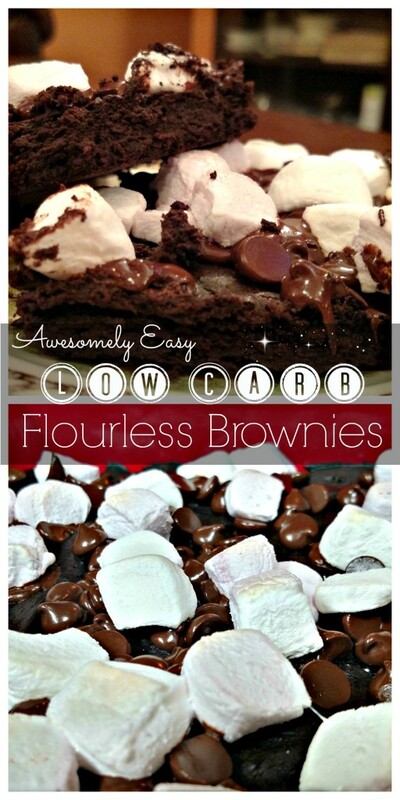 More importantly gooey low carb brownies he would actually eat. It can be difficult to make sugar free, gluten free brownies that taste like a traditional brownie. To try to offset this, I used three different sweeteners to my low carb brownies recipe. If you’ve never heard of xylitol, you really ought to give it a try. It has a chemical sounding name, but it’s actually extracted from birch trees, so it’s pretty natural. The xylitol honey adds to the sweetness and really gives the brownies a gooey texture. For the topping, I used sugar free La Nouba marshmallows. Oh my gosh, they’re the best low carb thing I’ve found in a long time. 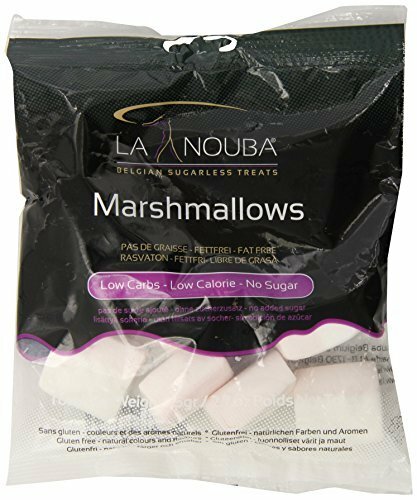 They taste just like conventional marshmallows and has 0 carbs. They’re half pink and half white, I’m really not sure why, because they taste and melt like a conventional marshmallow. Yummy. They even sell low carb chocolate covered marshmallows. Double yummy. I use these for making low carb desserts, but I even use them as a low carb snack when I’m craving something sweet. They’re quite large, so I use a pair of scissors to cut them up into mini marshmallow size pieces to make my gooey low carb brownies even gooier. 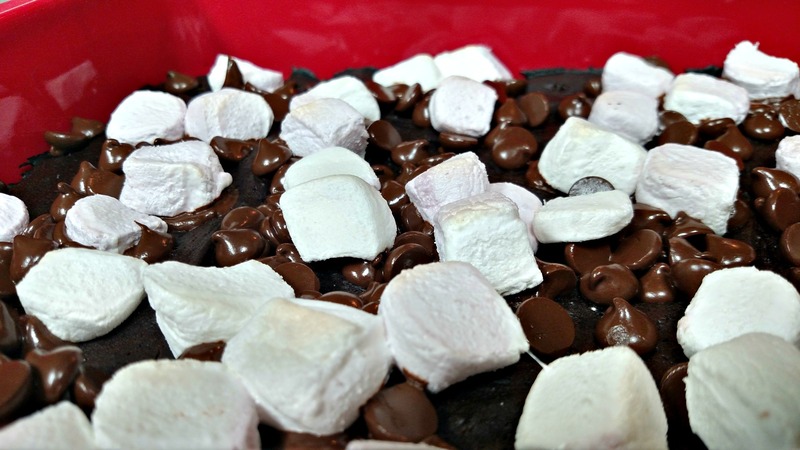 Sprinkle the top of your brownies with your marshmallows and sugar free chocolate chips. My family love these, and they go quickly around here. The only problem I have now is I have to share my low carb goodies with my family. But that’s okay. With these, I just might be able to throw out the processed sweets without a mutiny. Preheat your oven to 350F. Grease an 8x8 baking pan. Mix together the melted butter and sweeteners. Add the eggs one at a time and mix well. Add the salt, vanilla, and cocoa powder and stir until completely blended. 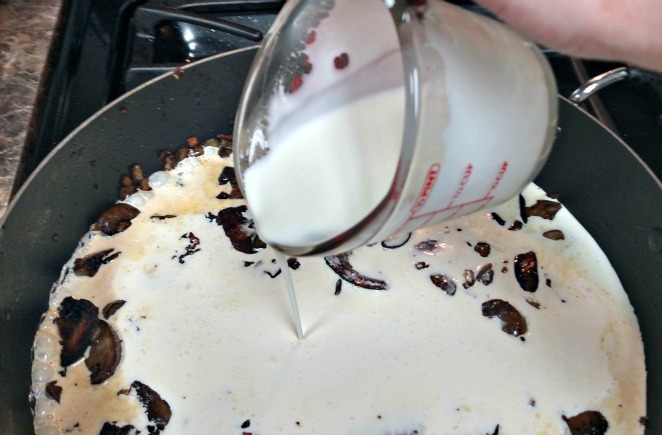 Pour the batter into the greased 8x8 pan. Bake for 20 minutes, or until just set. 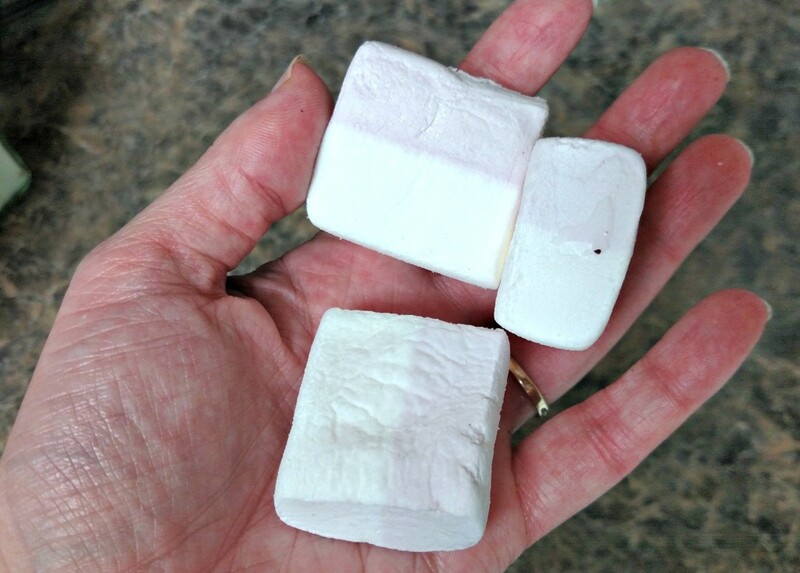 While the brownies are in the oven, cut up the marshmallows into small pieces. Remove from the oven and spread the chocolate chips and marshmallows over the brownies. Return to the oven and broil on high until the chocolate and marshmallows are melted. I think the reason why comfort food is called, well, comfort food, is because it takes you back to being a kid. If you were to start naming off different dishes, I could tell you who each one of those reminded me of. Cornbread stuffing reminds me of my grandma. Aunt Shirley makes an awesome apple pie. My Aunt Dorothy? Peas and dumplings. I could go on and on. 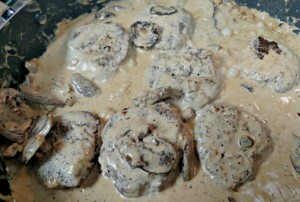 My momma could make some mean hamburger steaks with mushroom gravy from scratch. On the rare occasion that I got asked what it was I wanted her to fix for dinner, I’d always ask her to make homemade salisbury steak. With gravy, of course! Comfort food has taken on a whole new meaning to me lately. I know comfort food is called comfort food becuase it’s food you grew up on. But for me it reminds me of those powerful women in my family who are no longer with me. I haven’t tasted my mother’s cooking for years. For the past three years, she suffered from a rare disease that causes dementia. One of the early clues to me there was something wrong was her cooking became inedible. I didn’t know why at the time, but she had just plain forgotten how to cook. My mother passed away a few months ago, and it’s made me miss all the everyday things about her, such as her cooking, even more. 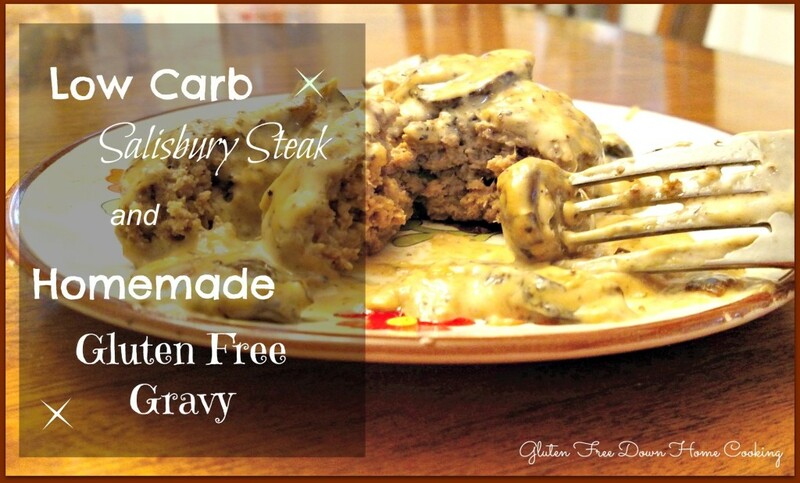 Yes, Low Carb Salisbury Steak and Gravy can be Comfort Food! That’s why her salisbury steak and gravy was one of the dishes I decided to remake. It was a no big deal to make low carb salisbury steak. I just had to skip fillers like bread or cracker crumbs and I was good to go. The gravy was a different story. I’ve tried out a lot of gluten free gravy recipes, but not too many of them, frankly, tasted like it was a keeper. I’ve also tried several gluten free gravy mixes . They were good, but sometimes you just want something homemade, ya know? 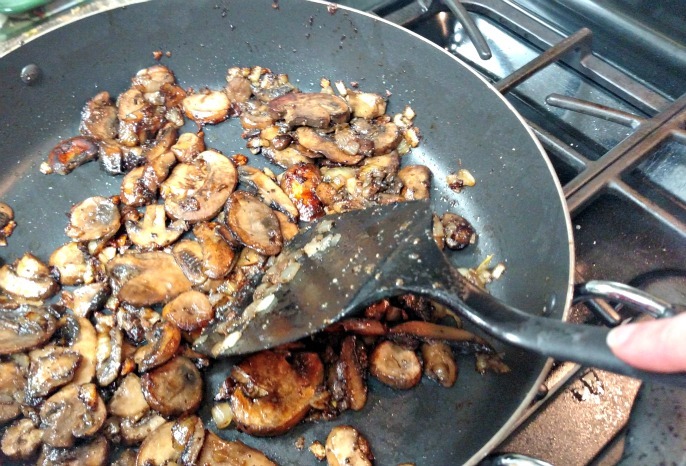 I went on a personal quest to find the perfect homemade mushroom gravy recipe. So I was thrilled when I was watching a cooking show one day, and I saw them make gravy by reducing cream. I’m like, voila! I can make me some gravy. Even better, I can make low carb gravy because whipping cream has zero carbs, and a whole lot of healthy fat. I have been having an obscene love affair with mushrooms lately, and how can you NOT have salisbury steak without mushroom gravy? So I made sure this recipe is chock full of mushrooms. 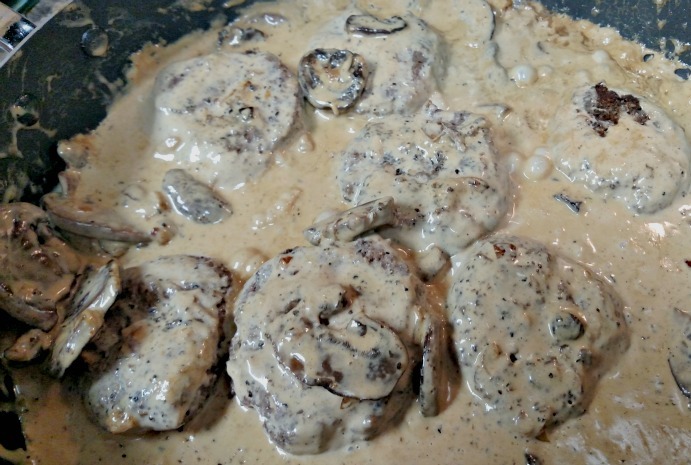 If you’re not much of a fan, you can use less or leave them out altogether and you will still have an awesome low carb salisbury steak and homemade gluten free gravy. First, patty out your hamburger. I didn’t add anything to my meat, but you could add 1/2 cup chopped onion for extra flavor. Salt and pepper them as much as you’d like. Cook your hamburger steaks until they’re nearly done. Don’t worry if they’re not completely cooked, because we’re going to put them back in the gravy to finish cooking. 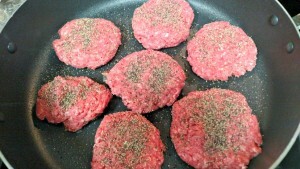 Remove the cooked hamburger patties to a plate and cover to keep warm. Pour out the hamburger grease, but don’t get rid of the crispy, meaty bits. That’s flavor that’s sticking to your pan! Melt butter, and add the onions and mushrooms. Cook them on medium heat, stirring occasionally, until they’re golden brown and soft, about 20 minutes. It may seem like a long time, but it’s waaaay worth it to use raw mushrooms instead of canned. Add the whipping cream and stir off and on until it starts to thicken a bit, about 5 minutes. 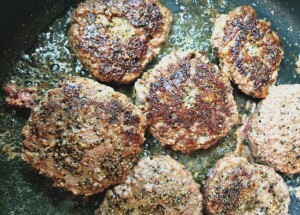 Place the hamburger steaks back in the gravy and turn them over to coat. Simmer on low covered until the steaks are done and the gravy is thickened. Stir occasionally to keep it from burning. Serve with mashed cauliflower, or mashed potatoes if you’re not worried about carbs. Patty out the hamburger to your desired size. Salt and pepper to taste. Fry in a skillet until nearly done. Remove from the skillet and keep warm on a plate. 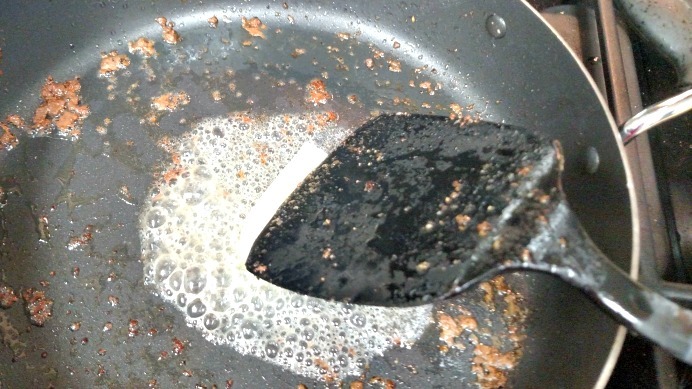 Drain grease, but don't scrape out any burger bits. Add mushrooms and onions to the skillet. Cook until golden brown and soft, about 20 minutes. Lower the heat and add the whipping cream. Cook stirring often until it just begins to thicken, about 5 minutes. Salt and pepper to taste. Put the steaks back in the skillet with the gravy, turning them to coat. Cover and simmer on low heat and cook until your salisbury steaks are done and the gravy is thickened. Stir occasionally to keep it from burning. Contains 7 carbs, 19g fat, and 3g protein per serving.